RetroCine has assembled a complete, pre-measured kit for use by movie enthusiasts who want to become fully independent and be able to shoot, develop and project their films the same day, but who did not want to get into the many details of the chemistry itself. The kit is very easy to use and appealing to the do-it-yourselfer who wants complete control over their film, to try push/pull processing and special effects without added lab costs. The kits are complete and pre-measured and include basic safety supplies. Complete & detailed mixing and processing instructions are available on the RetroCine site. The kits are designed for photographers, students, DIYers, hobbyists, and anyone else who wants to become fully independent. The kits are set up so that absolutely no measuring of chemicals is required. All chemistry is powder (no liquids), so it is easy to handle and has a long shelf-life. Simply pour into water, mix and you are ready to start processing you own film! 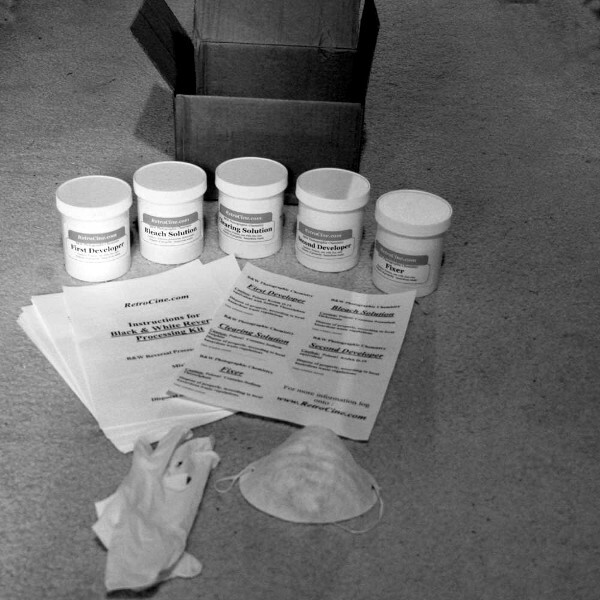 All the chemicals in the kit are photographic-grade. All kits are shipped via Fedex/UPS ground and all chemicals are legal for transport within the United States and Canada. If you are outside the United States or Canada and are interested in a kit, please contact us via email. Download the latest directions for the 1 gallon kit in PDF format. This kit includes all chemicals required to process black and white film in measured and pre-mixed packages. The kit will develop back & white 8mm, Super8, 16mm, 35mm and 120 film and is designed to process approximately 1600ft of super 8 film or 800ft of 16mm film. This kit will not develop color film. The 1-Pint kit is used in exactly the same way as our 1 gallon kit. This kit includes all chemicals required to process black & white film in measured and pre-mixed packages. The kit will develop back & white 8mm, Super8, 16mm, 35mm and 120 film and is designed to process approximately ten (10) 24-exposure rolls of 35mm B&W film. This kit will not develop color film. We can also take orders via our contact form or email.